This classic and useful bench is a beaut! 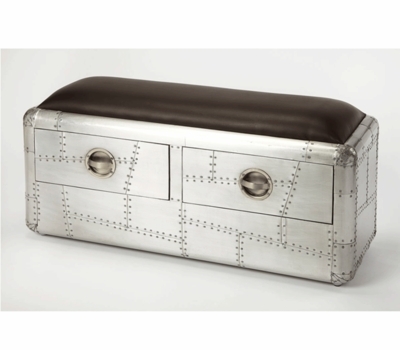 Aviation Furniture – Our Aviator’s Storage Bench is ideal for an FBO, aviator man cave, airplane hangar, airplane themed room, or anywhere you want to add some fabulous airplane style! This Aviator’s Storage Bench is a solidly built piece of aviation furniture with select wood as its base. The base is then covered with sheeted aluminum, and rivets that add to the aviation look. To make the bench look even more realistic, a slight distressing is applied to the aluminum giving a more aged appearance to the furniture as if the aluminum had been stripped off a downed aircraft. There are two easy open drawers for storage, and the top of the bench is covered with faux brown leather providing for a comfortable seating area. The Aviator’s Storage Bench ships as one piece, and weights 100 lbs., boxed. It is deliverable via truck service to the lower 48 states only, and will take up to 2-2 ½ weeks for delivery once shipped.